Book a car rental in Hobart with VroomVroomVroom for a fuss-free holiday. We compare deals from major suppliers such as Budget, Avis, Hertz, Europcar, Thrifty and Enterprise so you can easily find a car hire that will best suit your budget and needs. Just choose your desired vehicle and book to get a booking confirmation number in an instant. Hobart is the capital and largest city of Tasmania and is located in the south east corner of the State. The city is rich in history as Tasmania was once a former penal colony and Georgian era sandstone architecture peppers the streets of the city and outlying towns such as Richmond. A drive around the city in your car rental is what you need to get the most out of your stay in Hobart. Soak up it's spectacular sites and atmosphere. Why rent a car in Hobart at VroomVroomVroom? Having a rental car in Hobart makes it easier for you to explore the area at your own pace. No need to wait for the bus or train or call a taxi to get to your destination. VroomVroomVroom can help you find the perfect rental car in Hobart for your next trip. Wide selection of vehicles - You may choose to collect your car rental from Hobart Airport. We compare campervan hire deals in Hobart rates as well. Weather wise, the ideal time to visit this city is between December and January, which are the warmest and driest months. Rates after the summer holidays are perfect if you are searching for cheap deals anytime from February to November. Avoid winter months (June - August) if you are doing some mountain hiking as extreme weather and snow can be very dangerous. If you still have no idea where to go, check out our Travel Guide for unique experiences available in Hobart. You can view protected waterways from a seaplane, or relive Australian history at sites such as Port Arthur. With various locations in Hobart to collect your hire car, the option to pick up from the CBD or the airport gives you the flexibility to choose what's more convenient for you. Travel time from Hobart (via Midlands Hwy) to Launceston is about 200 km or two hours and 20 minutes via reliable rental car, while Hobart to Queenstown is nearly 260 km or three hours and forty minutes. Hobart to Devonport will take you nearly four hours, Hobart to Port Arthur nearly two hours, while Hobart to Cradle Mountain (via Midlands and Bass Highways) will take you more than two hours of driving in a hire car. Set on a magnificent deep-water harbour with a stunning mountain backdrop, there is no Australian city quite like Hobart. Don't miss a drive to the Salamanca Market, held every Saturday on the Hobart Waterfront, or a visit to Port Arthur, arguably one of the Australia's most significant cultural sites. Before you start exploring Hobart, it is advisable to check the live traffic update here so you can see the road situation and avoid getting stuck in traffic. Are you tired of doing the same stuff, staying in ordinary hotels, and eating at fast food joints? Hobart has more to offer and we at VroomVroomVroom have come up with a list of unique things to do during your holiday – from thrilling seaplane tours to historical tours. We also selected distinct accommodation and dining venues to give you an extraordinary holiday! 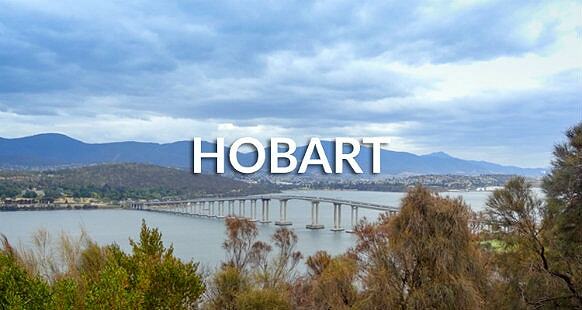 Check out our travel guide to making your Hobart experience one to remember. If you have some ideas to share, let us know. 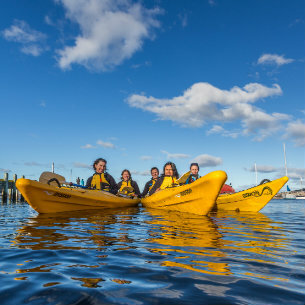 See Hobart's vibrant waterfront from a different perspective on Roaring 40°s Kayaking's 2.5-hour Hobart City paddle. Weave among the yachts, tall ships, fishing boats and cruise ships of this beautiful harbour before enjoying a floating snack of fish and chips. For the more adventurous spend a day exploring southern Tasmania's dramatic coastlines. On the Tasman Peninsula paddle along 200-metre-high cliffs to the awe-inspiring Totem Pole rock formation looking out for the resident Australian fur seals. Or explore the mouth of the River Derwent and the Tinderbox Marine Nature Reserve, paddling beneath rugged lichen-covered cliffs and along beautiful beaches on their Hobart's Cliffs, Caves and Beaches paddle. Go back in time and see how life was in Hobart by watching the shows of Live History! Instead of watching performances in a theatre, you will have to take a stroll outside to see different scenes. They called the strolling theatre Louisa's Walk as it tells the story of a character named Mary James, who was convicted in 1832 for stealing a square of silk. The show begins at the Cascade Brewery then it passes by the beautiful parkland, Hobart Rivulet, and Female Factory. Located on the Hobart waterfront, the TMAG is Australia's second oldest museum and is Tasmania's cultural heart. Catering to all ages, it's collection includes permanent exhibitions on the extinct Tasmania Tiger as well as Tasmania's other native animals and pieces symbolizing Tasmania's colonial history including works by John Glover. Situated 15 minutes in your car hire (or 30 ferry ride) from central Hobart, MONA has put Tasmania on the international art stage. It's collection of old and new art includes antiquities and ancient coins as well as custom and sometimes shocking modern art. The site is also home to restaurants, a winery and a microbrewery and is a completely unique experience in Australia. Bonorong Wildlife Sanctuary is a beautiful Australian wildlife sanctuary that was founded sometime in 1981. The venue is home to a wild range of wildlife and it also takes care of the sick and injured ones. Visitors will get the chance to not only see the site's beautiful wildlife but also to pet, cuddle and watch feedings of Tasmanian devils. What was once a jam factory, The Henry Jones Art Hotel is now one of the most sought after hotels in Hobart because of its amazing interiors and exteriors. There is art everywhere – from the Peacock Terrace and the Art Installation Suite to the Studio Suites. You will find the works of talented Tasmanian artists exhibited all over the hotel. Art can also be seen at Henry's Restaurant as Executive Chef Andre Kropp creates his own culinary masterpieces. For a unique dining experience, make sure to drop by Garagistes located along Murray Street. Just like the name suggests, the site of the hip restaurant is a former car rental garage. It is advisable to arrive at the restaurant early because of its no reservation policy and shared table dining. If you're a group of six and above, then you can make a reservation up to 14 days in advance. Chef Luke Burgess has championed the idea of using natural landscape such as edible shore plants, berries, herbs, and weed to add flavour to his dishes. Feedback: The car was not available. Very unhappy. Feedback: Insurance and excess should be stated in the Vroom Vroom site. I had to go into Europcar Chat to determine what excess applied to a standard rental, to know what to purchase from Hiccup within your site. Feedback: Thanks - very easy process! Feedback: THIS WAS SOOOO EASY! Avis Hobart - 2-4 Market Place, Hobart, TAS. Budget Hobart City - 96 Harrington St,, Hobart, TAS. Europcar Hobart City - 112 Harrington Street, Hobart, TAS. Enterprise Hobart City - 67A Argyle St, Hobart, TAS. Hertz Hobart Downtown - 122 Harrington St, Hobart, TAS. Thrifty Hobart City - 65 Argyle St, Hobart, TAS.